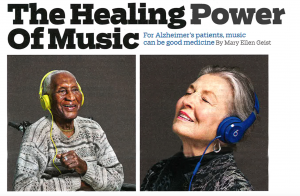 For people with Alzheimer’s, music can be good medicine. New research is confirming and expanding an idea long held by those who work with people with dimentia. Music can not only improve the mood of people with neurological diseases, it can boost cognitive skills and reduce the need for antipsychotic drug.